Gandhinagar, nestled on the west banks of the river Sabarmati, is the newly crowned capital of the state of Gujarat. 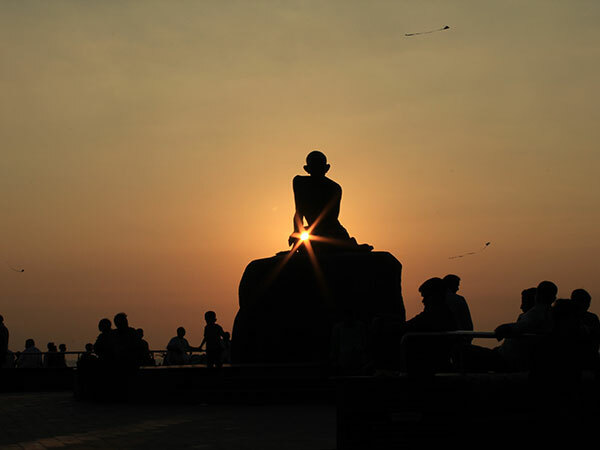 Located just 27 km away from Ahmedabad, the former capital of the state, the city of Gandhinagar has been named after the great Mahatma Gandhi and it was in the year 1970, that the secretariat was moved here. Gandhinagar is in stark contrast with Ahmedabad, as the later boasts of a more chaotic city life, where-as Gandhinagar is more peacefully aligned. The city is a well-planned one with an architectural layout of broad avenues, properly laid out sectors, roads, fortified houses, residential areas, open areas, proper jogging tracks and walking gardens. Gandhinagar portrays a class of well-planned area and has tried to connect with the modern trends without leaving behind the cultural roots. Being the capital of a state, it surely lives up to your expectations of a city, and enlisted here are the must-visit places that you must check out while on a trip to Gandhinagar. By Air: Gandhinagar does not have an airport of its own. But the nearest airport to Gandhinagar is the Sardar Vallabhai Patel International Airport of Ahmedabad. Its location is just 16 km away from the city. From the airport, frequent cab services are available to take you to the town. By Rail: There is a major railway station in the city of Gandhinagar that is frequented by trains from all the major cities of the country. By Road: Buses to the city of Gandhinagar are available from major cities in the country. The bus junction of Gandhinagar remains quite busy with frequent bus services that connect the town to other parts of the country. The best time to visit Gandhinagar is in the months of October to March when the weather is pleasant with an average temperature of 12°C to 30°C. The Akshardham Temple in Gandhinagar is one of the most prominent temples of the city and is, without doubt, a major crowd puller. The temple is a melting pot of enriched traditions, religion, art, architecture, exhibitions and so much more. Its tagline reads, "This is a place where art is ageless, culture is borderless, and values are timeless." Sprawling across an area of over 23 acres of land, the temple walls are adorned with brilliant and intricately detailed craftsmanship that reflect the architectural genius of the artisans. Over 1000 artisans were responsible for such a magnificent piece of art and it took over 13 years to complete this masterpiece. This architectural masterpiece is bathed in nearly 6000 tonnes of pink sandstones, that stands tall amidst the skillfully manicured and beautifully carved pavements. The temple is devoted to Lord Swaminarayan, whose idol is a 7-ft tall gold-leafed statue. Tourists from different parts of the world flock around and pay a visit to Gandhinagar to witness this architectural marvel. The country's own version of Jurrasic Park, the Indroda Dinosaur and Fossil Park in Gandhinagar is said to be the second largest ground where the dinosaurs hatched eggs. The park boasts of the fossilized eggs and skeleton parts of some colossal extinct dinosaurs. As a sole dinosaur museum in the country, it is considered as the second largest hatchery of dinosaur eggs in the whole wide world. The Indroda Dinosaur and Fossil Park is nestled on the banks of the Sabarmati river and sprawls over an area of 400 hectares of land. Other than this, the park is also home to animals, like nilgais, langurs, peafowls, snakes, deer and several kinds of birds. With facilities of camping, amphitheatre and skeletons of many sea mammals, the park makes for a great place to visit when in the city. On the banks of the River Sabarmati lies the Sarita Udyan, a beautifully manicured garden boasting of spectacular flora. Come explore the vibrant hues colouring and shading the land as far as the eye can see and soak in the natural splendour. The place also hosts a lot of recreational activities. A popular tourist spot and a favourite picnic hot-spot for the locals, the Sarita Udyan is a refreshing place for a lazy stroll or just to spend some quality time with your family and near and dear ones. Set against the striking milieu of the calm and tranquil Sabarmati river, the garden is truly something of a sight to behold! The Adlaj step-well is a beautifully and intricately step-well, which is more popularly known as Vav, by the locals. The step-well resonates architectural specimen of the spectacular Indo-Islamic architecture. The Adlaj step-well dates back to the 15th century, and was constructed by Queen Rudabai, and has three entrance staircases and is adorned with intricately detailed ornamental carvings of the motifs of flowers, leaves and birds on the walls and pillars. A five-storey octagonal step-well with mythological citations and connotations swathing the walls and the pillars, it is an excellent illustration of the architectural genius of its craftsmen.